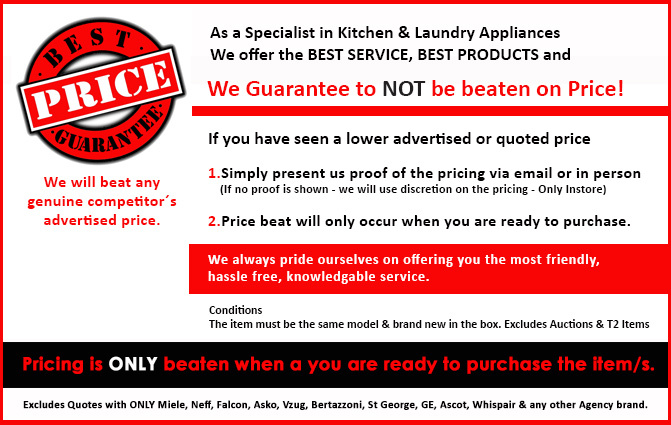 We Guarantee to NOT be beaten on price! At Berloni Appliances we pride ourselves on outstanding on hassle free specialist customer service with unbeatable prices. We value spending extensive time with all of our customer, to go through all product choices. Due to the extensive service we provide, we would hate to lose your business on price alone and we offer our best price guarantee on all individual products as well the only Package Price Guarantee on the market. Please read the full details below and don't hesitate to contact us with any queries. 1. Excludes agency brand purchases only. 2. To guarantee we will provide you the best package price available, if you happen to find a better package price then ours we will NOT ONLY MATCH IT but give you from $100 + CASHBACK Voucher that can be used where accepted. Voucher is a choice of major retailers including major shopping, fuel & outlets. 2a. Cashback value is determined on the value of the package. 3. The package must be multiple products above $3500 to apply and must be exactly the same models brand new in box. Excludes T2, Ex Display & Auctions. 4. Proof of the pricing must be provided to apply, if no proof can be provided Berloni Appliances will use discretion if the price is genuine to purchase on the spot. If you are unsure on your package please contact us so we can assist you with the best package price available. We guarantee the best price on all Liebherr's fridges,freezers & wine cellars, otherwise we match any written quote or advertised price PLUS give you a $100 Cashback*. Cashback Voucher is a choice of major retailers including major shopping, fuel & outlets. Price guarantee only applies at the time of purchase once an advertised or official proof of pricing is provided. Only applies to brand new in box products and some ex display units (if available). Excludes all T2, Clearance, Out of Box or damaged units. Excludes comparisons to Auctions or second hand sales.